The year is coming to an end, and what a crazy year it has been. Right from the start of 2017, marks the venture of my life as a struggling artist. I didn't really have much plan in mind, neither do I know exactly where I want to go. But I knew I wanted to sell my art/crafts at Public Garden's seasonal flea market. And I needed to get there somehow, since I was largely new and didn't had any flea experience on hand, neither do I know whether anyone would like my art. And bam, without much to think about, and without any products already produced for sale, I decided to sign up for my very first flea market at Singapore Art Museum, organised by The Local People. 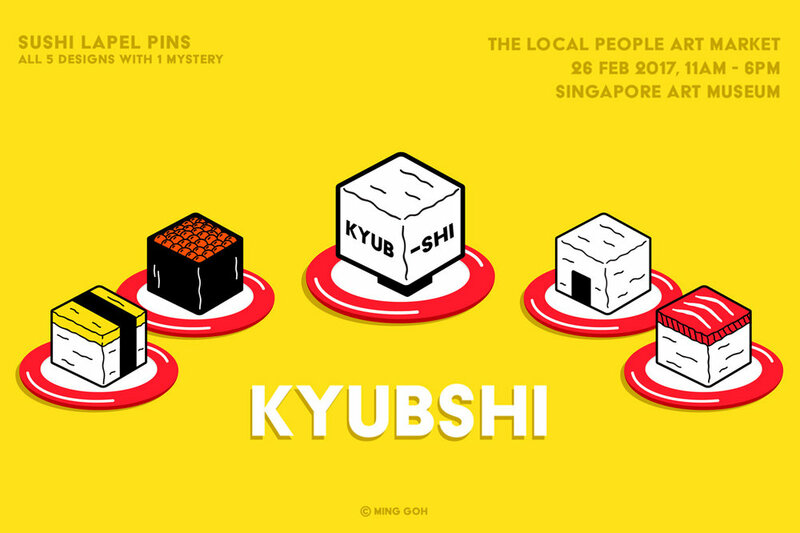 And then, what came along with the rush deadline was my Gachapon machine, along side my very first series of enamel pins - Kyubshi, and mmongi who graduated with me from my schooling days. At that time, I figured I would try live portrait drawing too, without thinking too much that anyone would even purchase an eccentric portrait of themselves. But the response was good, way too good! The momentum kept it going. And I made it to Public Garden for the very first time in February. Fast forward to today, I have already been to my third Public Garden appearing as a vendor! This time round, I have two Gachapon machines and expanded my weird portrait series into handcrafted brooch pins. It was such a joy to create lovable products, like the Daruma series. And surpringsly, mmongi.desu is still going really strong even though I have thoughts to retire the series. To think that I have come this far, but yet it is only the beginning of this venture. All I know that, it has been a good year. A good first year, and to know that if you believe in it then all will come true, but you definitely got to work towards it. I have no clue, and for the very first time I have no definite answers for what is ahead for me in the year 2018. Perhaps, I'm just a little exhausted from all the hustling. So from, I'm taking a little step back and enjoying some 'me' time, celebrating my favourite holiday season of the year. See you, in 2018. There will definitely be more of me, and more works to be put out there. There’s a certain craze that goes on in Japan that had me caught in it as well. 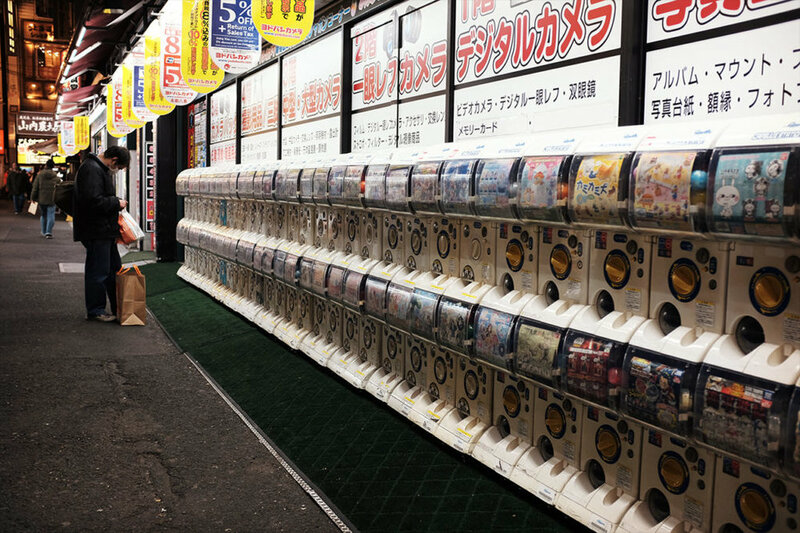 The 300¥ balls, or also know as Gachapon / Capsule Machines. Everytime I take a trip to Tokyo, there’s always one place I would never fail to visit. It’s this little store over at Akihabara. This little store is packed with Gachapon machines, with all sorts of toys stocked. This is probably heaven to me, as an avid toy collector and a soft spot for all things weird, this is where I spend majority of my cash away. Just 300¥ for one, and then 300¥ for another one, and another one, before I knew it, I have spent more than hundreds in this tiny little store with a bag full of balls. They’re everywhere, in the mall, by the street, in train stations, in museums, at universities, and they have all kinds of little knick knacks, collectible toys, and hand crafted products. I love it and I have a crazy addiction to these things. But sadly, these aren’t as common as they are, here in Singapore. Not often do you come across a store where they have Gachapon machines lined up neatly and well equipped with a coin changing machine for your convenience. 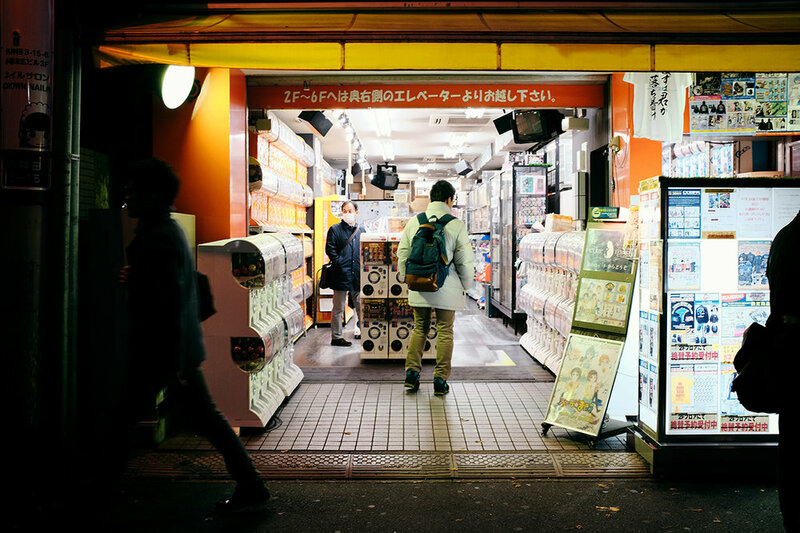 And even when you do find Gachapon machines here, they are commonly filled with the more popular anime stuff that our locals are familiar with. It’s kinda sad not being able to feed my Gachapon addiction while I’m back here in Singapore, but I’m looking to change that.